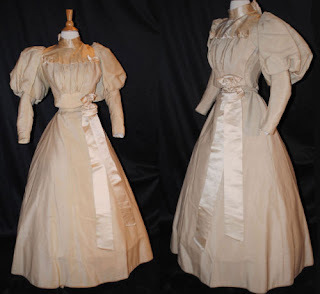 All The Pretty Dresses: 1890s Creamy Dress - Sleeves of DOOM! 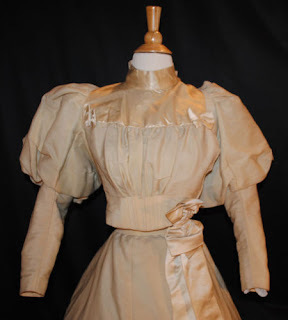 1890s Creamy Dress - Sleeves of DOOM! A regal late 1895-1897 light beige challis with satin accents around front neck. 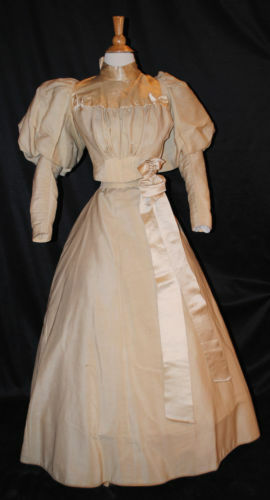 This 2 piece gown has been de-accessioned from the Rochester historical museum in New York state. 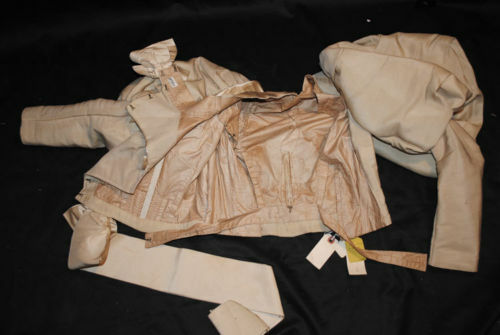 The gown still retains it's original Museum ID catalog tags inside bodice and skirt as well as string tags with donors name, Miss Dorothy Rice. The bodice is accented with light beige satin on neck line and front of bodice with a side bow. 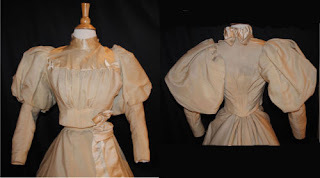 The bodice is lined with cotton and with 10 covered whale bone baleen stays and has inner front hook and eye closure. The inner front closure acts like a corset. 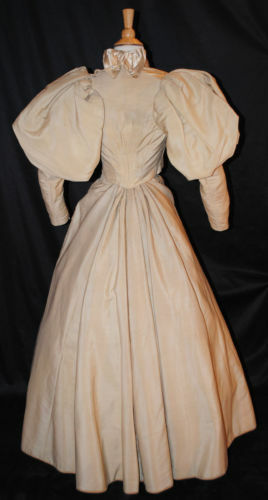 Sleeves are curved with a large puff leg of mutton sleeves. Satin collar is rough with shredding. No underarm staining. Attached to bottom edge of bodice is a large bow and long streamers. The skirt closes by hooks and loops at the back and gathers with cartilage pleats in the back for a nice fall and sweep. The skirt is lined with cotton and buckram. In very good condition. Has a inner side pocket. The bodice and skirt have hooks to attach and hold up the weight of the skirt. Condition: The dress is in good condition for its age. 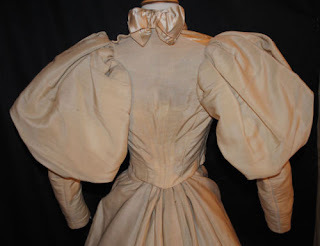 BODICE: No underarm staining, and has some small wear holes in puff sleeves. Some very small age spots scattered about. Satin on bodice has shredded at edge of neckline. Water staining on inner lining only. 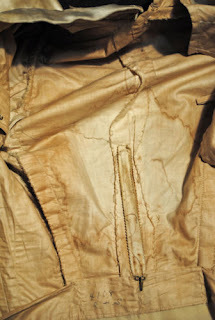 SKIRT: is in very good condition with no stains. Back seam opening has 4" at seam that needs to be sewn closed. Some very small age spots scattered about. Curved Sleeve Length 25", Across back shoulder 8-1/4", Shoulder to bodice hem 18". Back skirt sweep 39-1/2", Waist 24-1/2". 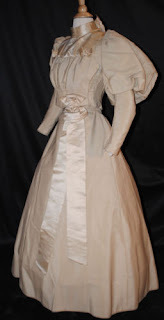 A truly grand display dress/gown or for study or pattern. Antique clothing should not be worn. I love this seller. At least s/he knows what s/he's talking about! Notice the "corner bows" on the pink dress are in a very similar placement to the extant one. Love this dress. Adore the sleeves! 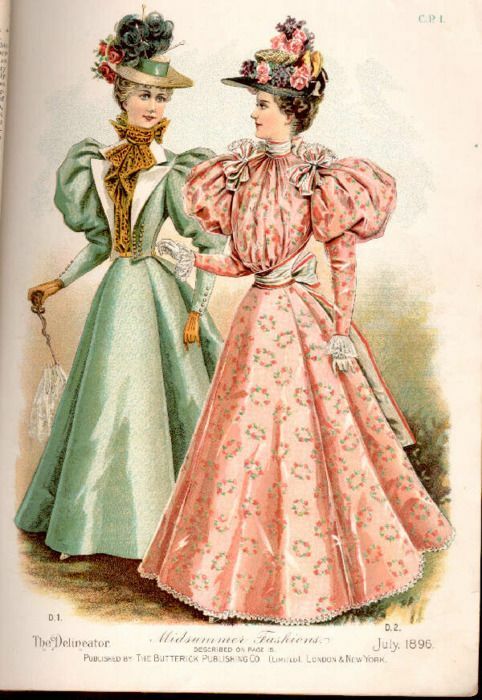 I haven't done much 1890's but I have found the sleeves make your waist look smaller. It's really a fun style to play with.